There’s just something about Kasie West’s writing-style that makes an otherwise silly plot and shallow romance into something sophisticated and poignant. Her stories are addictive, entertaining, and just plain fun–in the truest sense of the word. The majority of the action unfolds on a zombie-romance movie set and in the on-set trailer of 17 year-old Lacey Barnes (FUN, right!?). Lacey is an ambitious and talented teen on the verge of stardom now that she is acting opposite one of young-Hollywood’s most eligible heart-throbs. But her fame and climb up the acting ladder have come at a price–her grades. Long story short, Lacey ends up with one super cute tutor who has to compete for her attention (and affections) with her annoyingly charming and confident co-star. The story doesn’t really feature a love triangle (sorry if that disappoints some of you), but there is some great tension created by the competition between the two male MCs. Although the fantastic covers and cute plots and settings of Kasie West’s stories may lead you to think that the characters will be superficial–they’re not. Each character is interesting and fleshed out adding depth to the story. I think the pacing could have been faster and the book could have been shorter. For 384 pages, the novel should have used up more of that type-set on scenes between Lacey and her tutor. Overall, I enjoyed the mystery aspect to the plot (think–who’s trying to sabotage my acting career?! ), and I enjoyed the chemistry between the two MCs. 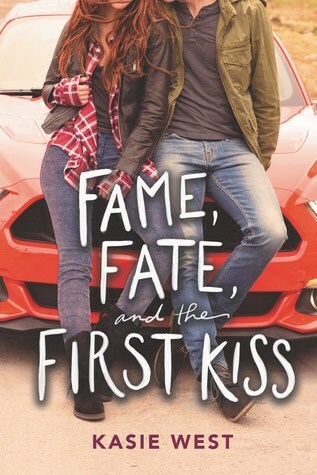 Fate, Fame, and the First Kiss is a fun and entertaining novel and I definitely recommend giving it a read. Selena Gomez, who just happens to be starring in a 2019 film callled The Dead Don’t Die!!!! I kid you not! Click on the photo to redirect to the IMDB page. Click on the photo to be redirected to a great, candid interview with NC in W Magazine! The caption of this photo online reads: ” Noah Centineo describes his dream date with Selena Gomez.” !!!!!! Click on the pic for deets on this photo!!! Woooowwww. My matching making skills are on point. The film story within the story of this book totally reminded me of the films Warm Bodies and Pride and Prejudice and Zombies. I think it’s time I re-watched them!